The Lufira Masked Weaver Ploceus ruweti, known previously solely from the holotype collected at Lake Lufira (= Lake Tshangalele) in Katanga, south-eastern Democratic Republic of Congo (Congo-Kinshasa), in 1960, was rediscovered nesting at the same locality in February - March 2009. This discovery was reported in Bulletin of the African Bird Club - see here for a link to the paper. In a new paper, a range extension of 120 km is described for this species. All records are in the Lufira River valley and it is expected that the weaver occurs in the intervening area. Two females were captured, ringed (AP23405 and AP23406) and released. Also see Craig A, Hasson M, Louette M. 2010. Retracing old footsteps. Katanga's endemic weavers. Africa - Birds & Birding 15(6):42-47. 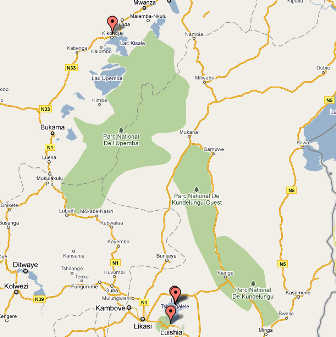 Map: records of the Lufira Masked Weaver in the Democratic Republic of Congo; the southern records are around Lake Tshangalele (formerly Lake Lufira).